Last spring I created this chart for a class I was teaching on herbal first aid. The chart covers commonly used herbs and essential oils and their properties and gives suggested remedies for common first aid situations and illnesses. This laminated chart is two-sided. 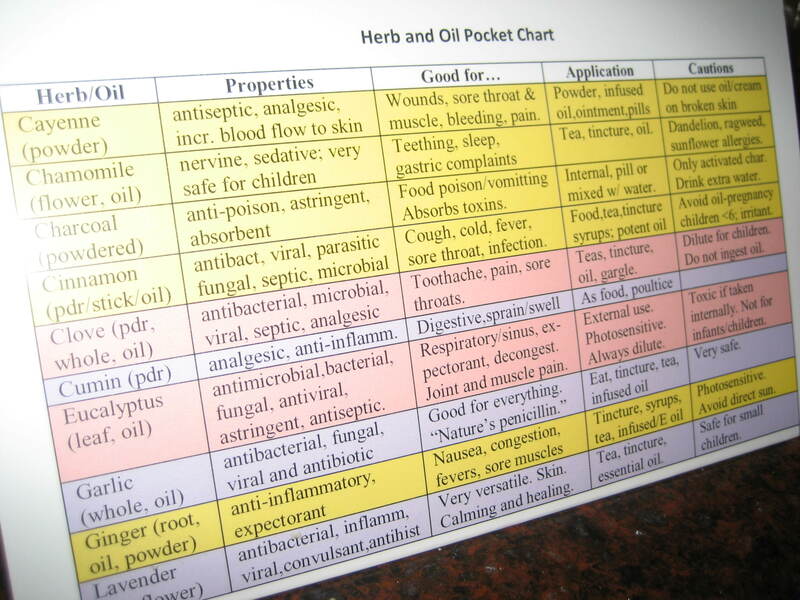 The front side is color coded based on the safety of the herb or oil and covers 17 herbs/oils. 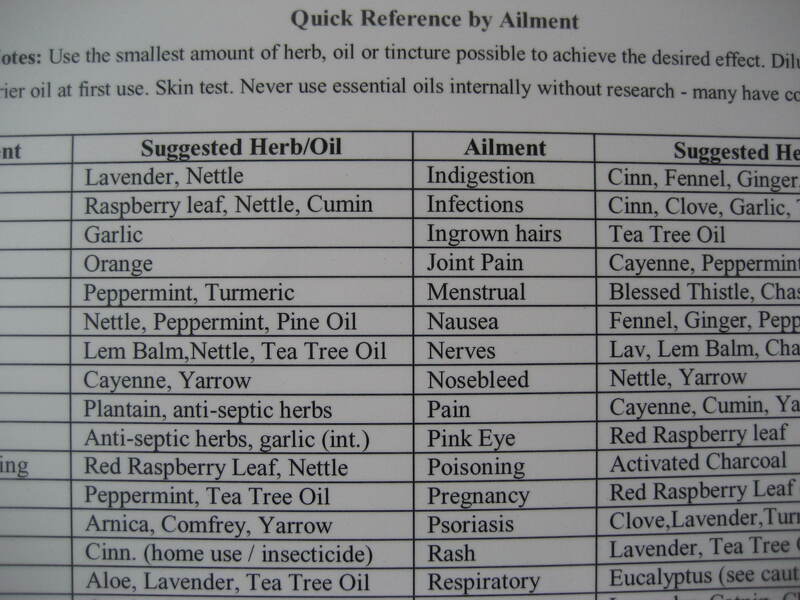 The back side of the chart is covers 66 ailments and conditions listing the herbs/oils that are good for them. Cautions are listed on the front of the chart. I’ll be offering this for sale on Amazon this for sale on Amazon in the future, and have plans to eventually offer an expanded Kindle format was well. In the meantime, however, if you’d like to buy one from the source (me), you can comment on this post you will receive payment instructions via email. Cost is $5.00 (free shipping). The chart measures approximately 7 x 4 inches. It is printed on heavy cover stock and laminated so that you can take it with you so that you’ll know what to do when you are out and about or travelling away from home. If you find it helpful be sure to comment here and let me know. Back side of the chart. Disclaimer: By purchasing this chart, you take full responsibility for any outcomes based on it’s use and release the author from any liability either real or perceived. The author makes no claims as to expected results and takes no responsibility for either positive or negative results. This chart should be considered to be personal opinion and is based on personal research and should be taken as such. It should be used with common sense, your own personal research and should not be considered medical advice. See full Disclosures/Disclaimers here. By requesting to purchases this chart you release the author from any liability and agree to all the terms and conditions in the Disclaimer linked above. 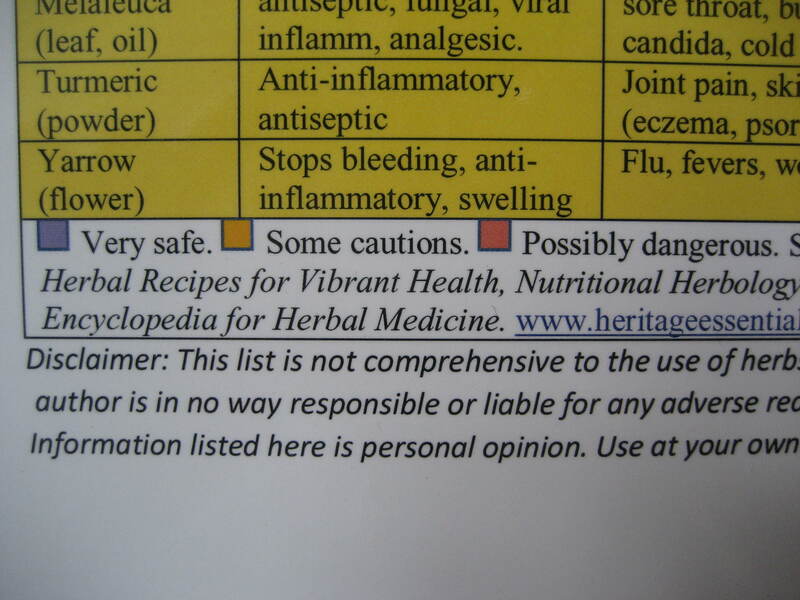 This entry was posted in Essential Oils, Herbs, Medicine Cabinet, Products. Bookmark the permalink. ← Saturday Morning Baking – pancakes, granola, croutons, graham crackers galore! Pls send information on how to get your chart.